This past week Adidas released the new Adidas Predator Instinct Supernatural, just as they are also setting up to release a few other models. We will be able to see players like Mesut Ozil, Di Maria and Xabi Alonso wearing the new Predator Instinct Supernatural boots as early as this week. The boot design seems to give the boot a look of two different boots meshing together. The forefoot part of the boot is green with a rugged surface for better ball control while the heel area is navy blue with the normal Adidas soft surface. That rugged area of the forefoot is made from Hybridtouch, similar to the Nitrocharge boot. The bottom of the boot follows their usual pattern for stability, performance and better grip to any surface condition. 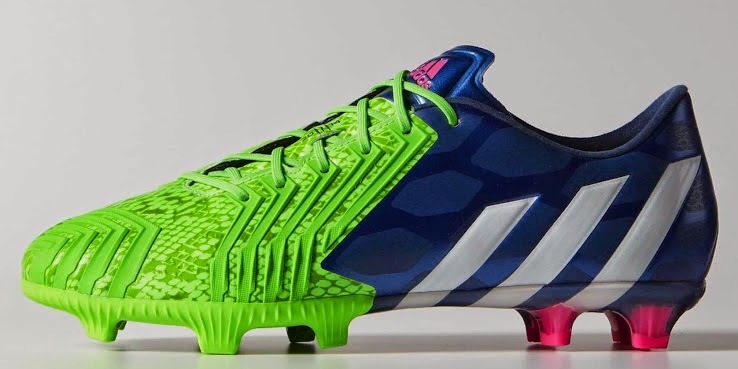 The new Adidas Predator Instinct Supernatural hit stores on November 4th and will cost around 220 euros.